*Please note that this is available in e-book format only, and printed copies are not available for purchase. Follow the links below to purchase your copy of the e-book. Thanks. This collection presents a fresh voice of a talented poet Sadaf Saaz, to win you over with her delicate word play, crafted over three decades. 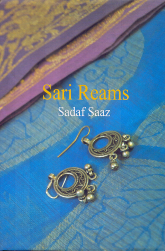 Flow along the meandering verses to explore the ethnic delights of the mango, glass bangles and colourful edges of sari, adorning the riches of this land. Immerse in the passionate voice that speaks of love and yearnings, and a freedom, rights and social causes. Having grown up abroad, Sadaf is a true Bangladeshi at heart, and the rich verses aptly show her love and vision for the country. …. a place that is her destiny.